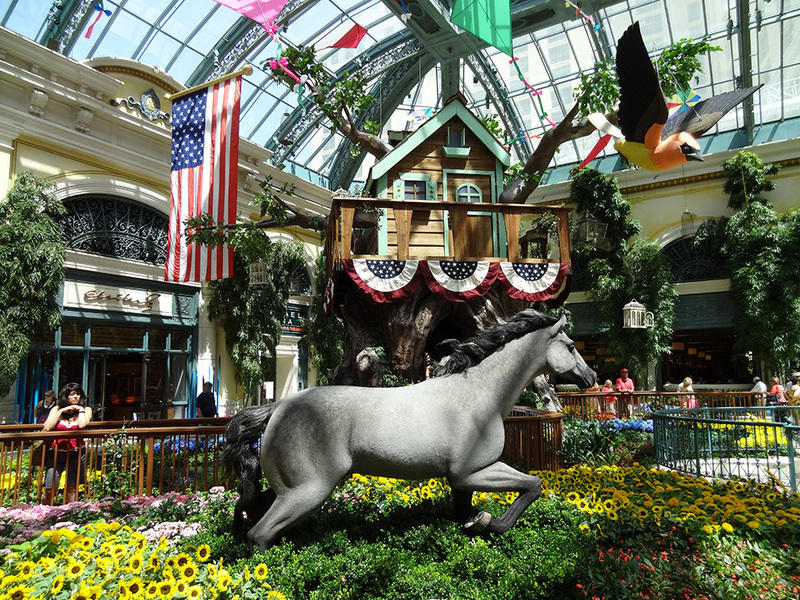 Herein lies one of the top free activities in Las Vegas — families included. 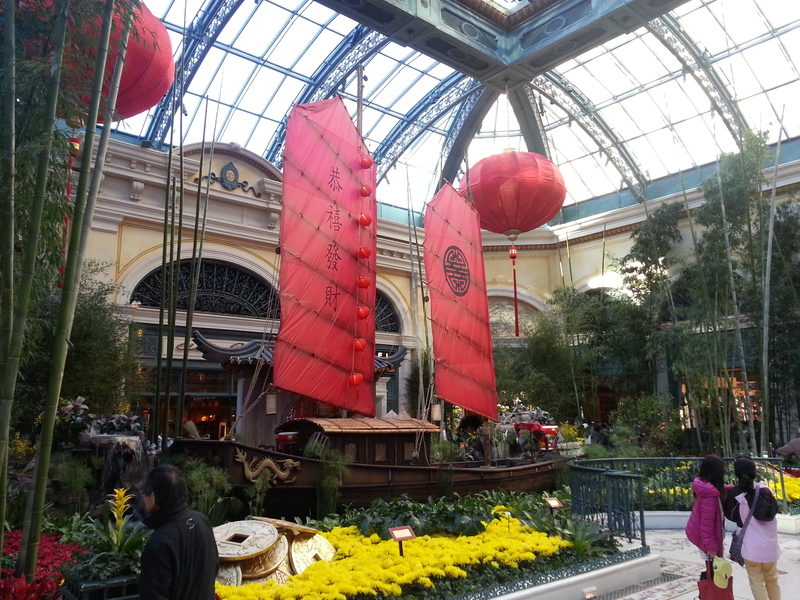 The Bellagio Conservatory & Botanical Gardens create stunning themes to celebrate every season plus the Chinese New Year. Spring signifies change, renewal, rebirth. What better way to celebrate this than by showcasing butterflies and flowers? You can see colorful huge imitation butterflies hovering above you, created by imaginative artists, or real ones fluttering about in the light-filled, glass-brick greenhouse built especially for this exhibit. Butterflies have been cocooning, changing, and flourishing for over 40 million years. We may learn something. 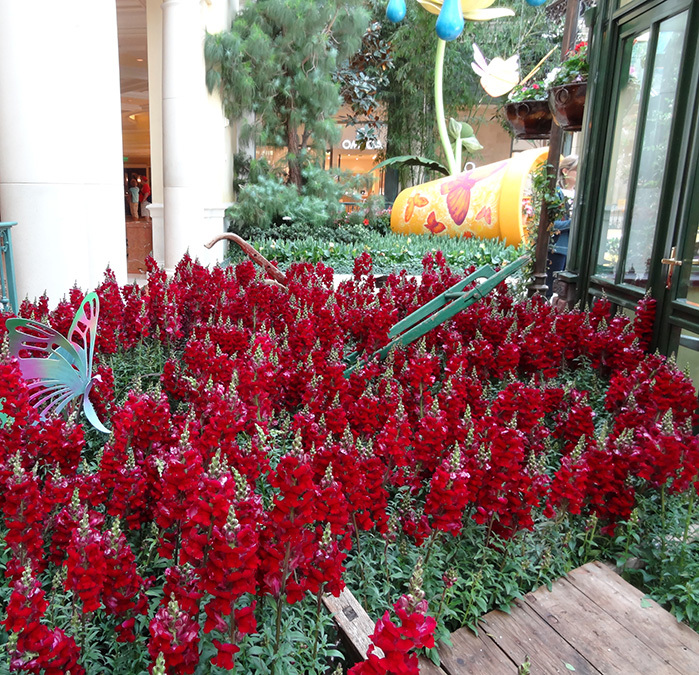 Flowers surround you as well, real and imagined, in various colors, smells, and sizes. Stroll by Tulips, Iceland Poppies, Hyacinth Orientalis, and Lillies, bursting with bright yellows, purples, reds, pinks, and oranges. 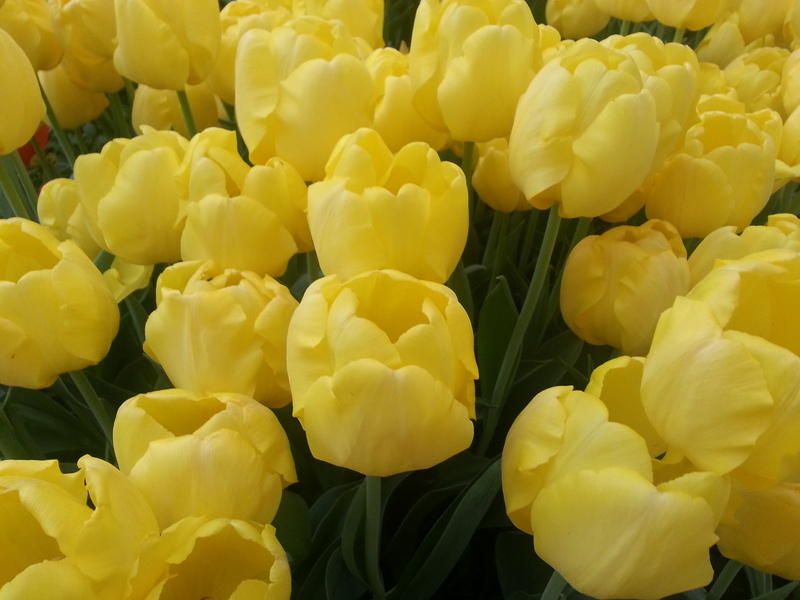 The flowers are fresh and fragrant—you will walk out feeling far better than when you walked in. 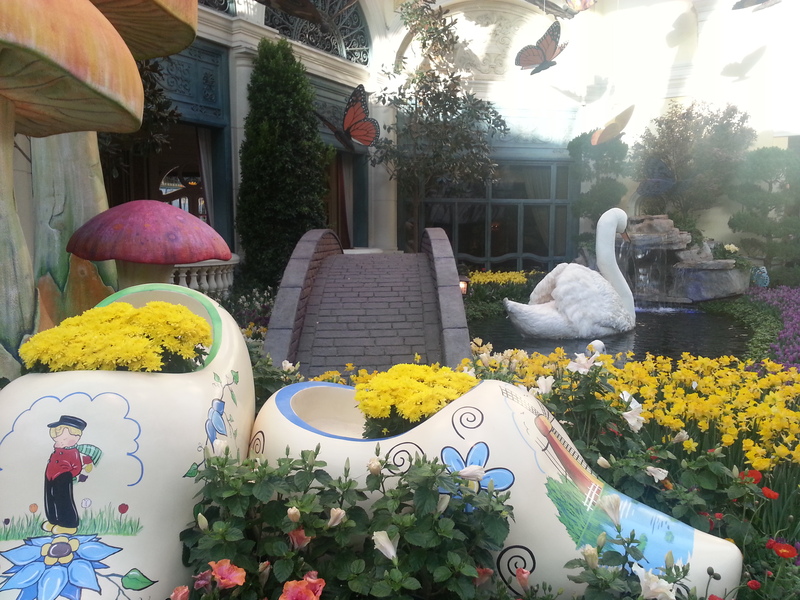 To accent the flowers and butterflies they’ve created a two-storey windmill, small foot-bridges, ponds, fountains, Dutch clogs the size of motorcycles, big red paper-mache ladybugs and large paper-mache swans. You need not ask the question, will my children like it? Two more pleasant surprises: you can learn tips or ask questions of “Mr. and Ms. Green Thumb” from 10:30am-11:30am, and hear live music (heard in video below) from 5pm-6pm. 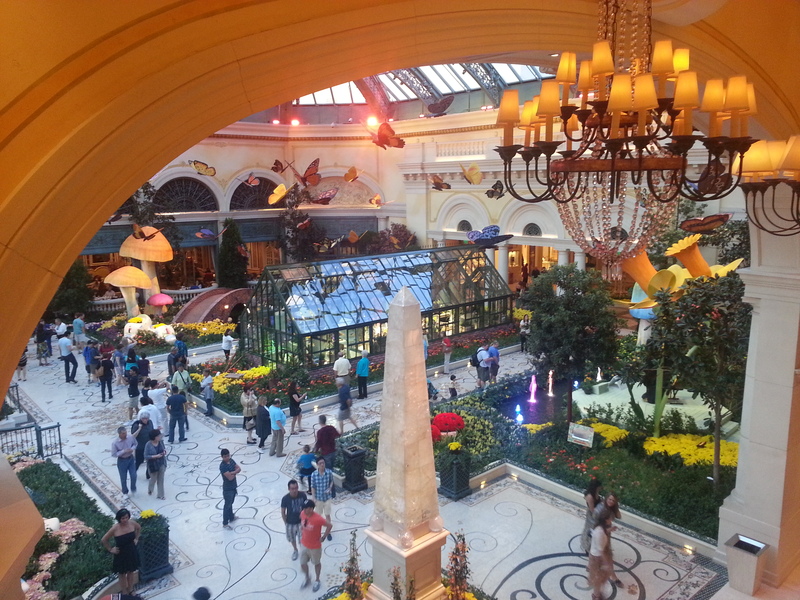 You simply can’t miss with the Conservatory; it’s free, festive, and invigorating. Myriad workers, artists, and specifically 140 horticulturists have worked round the clock for a week to bring you this Spring Celebration. It doesn’t cost you a single shekel. Cheers. It’s a Word Press theme, though we’ve done a lot of hand-coding and tailoring.